The vintage holiday table is EVERYTHING. Plates of hors d’oeuvres and meat atop piles of greens and nuts in their shells and bowls of fruit: it’s all just so wonderful and quaint and imperfectly perfect. In my 32 years of life I’d not yet attempted a retro holiday spread, so this year, it was about damn time. I didn’t want to simply remake everything straight from a Betty Crocker cookbook, so together with my amazing friends Ashley & Natasha & Juliana, we decided to modernize the retro table: to meld the kitschy charm of the 50’s with food you’d actually want to eat today. Tash made mashed potatoes and Roast Beef, and Ashley made technicolor deviled eggs. And what did I make? JELLLLLLLLLLLLLLO of course. This red one, TBH, looks beautiful but was not tasty so I am not going to post the recipe for it. I was inspired by The Jello Mold Mistress of Brooklyn to try a boozy jello creation, so this was my take on a gin fizz but it ended up tasting like cough medicine and I wouldn’t suggest you make it. Sorry. BUT, I do actually have a good Jello recipe, and it’s for my Lemon Chiffon Jello that’s actually tasty and you should make for your next gathering and people will be delighted and impressed. Happy holidays!! 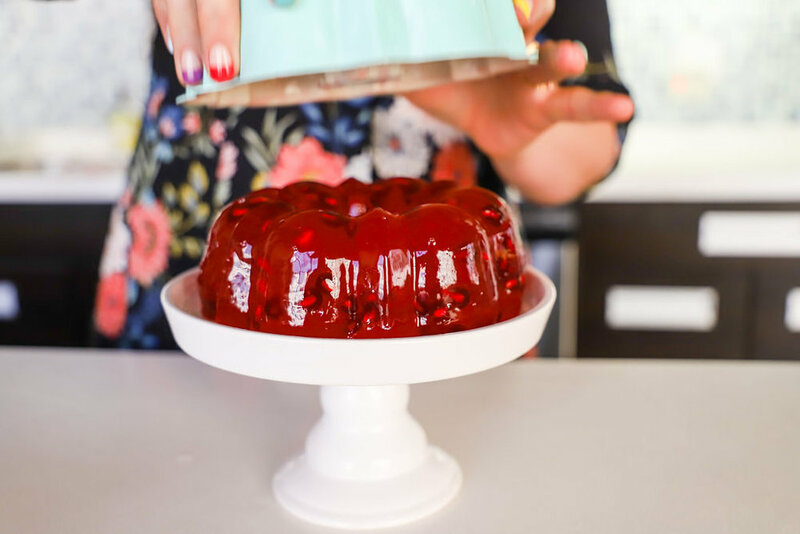 Note: This is a 9 cup recipe, so I used this steamed pudding mold as my jello mold, but you could always adjust for whatever mold you have available! In a medium bowl, combine the lemon flavored gelatin with 3 cups of boiling water and whisk to combine. Add the 1 1/2 cups of cold water and whisk again. 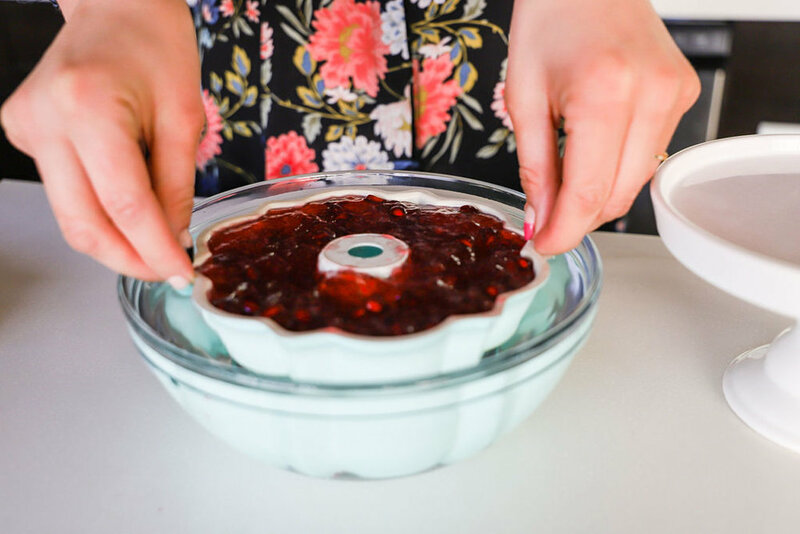 Pop the mixture in the fridge and let it begin to solidify - you’ll want it to be the consistency of jam (when it’s a little loose and spreadable) before you spoon it into the mold. Meanwhile, in another medium bowl, sprinkle the 3 envelopes of gelatin powder of 1/2 cup of cold water and let the mixture sit for a few minutes. Microwave it for a minute or so and stir it up well until all of the gelatin has dissolved. Add the boiling water and the sweetened condensed milk and whisk to combine. Add the mixture to the fridge, allowing it to start to firm up. When the lemon jello has become thicker but still is soft like pudding, take it out of the fridge. Spoon the mixture into your mold. Pop the mold into the fridge - it’s time to add the next layer once the first layer has solidified a bit. When it’s time to add the milk layer, spoon it in gently and pop the filled mold back in the fridge overnight. To release the jello, make sure you’ve let it sit in the fridge ALL NIGHT. Or at least 8 hours, but I tried this a few times and it was way better when it hung out overnight. Honestly, I have’t found a totally foolproof way to release jello from its mold yet, but I think I got decently good at it so here it is. 1) Fill a large bowl with HOT water, like almost boiling. 2) Have a plate or cake stand ready. 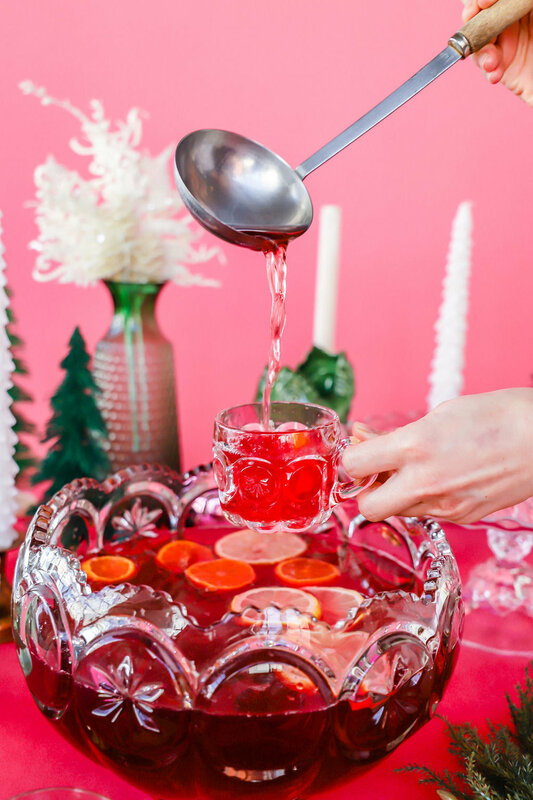 3) Gently lower the mold into the hot water, carefully holding the edge and not allowing any water to seep into the jello. 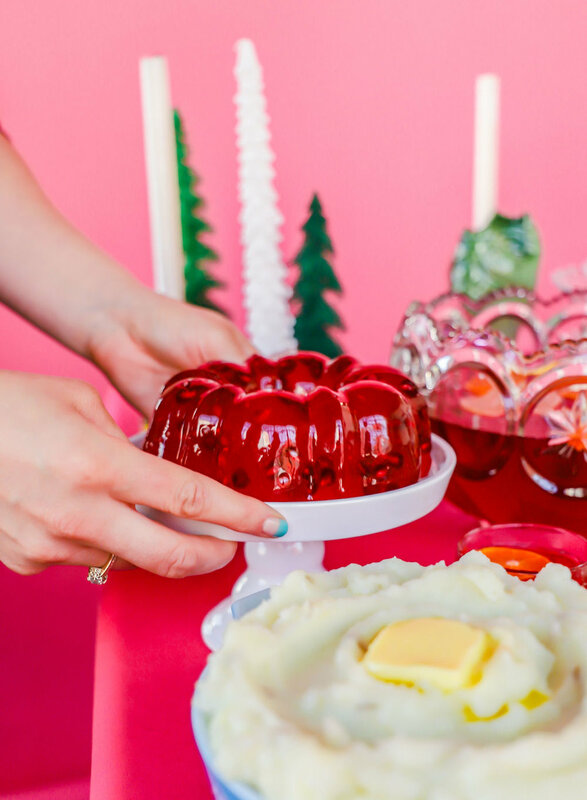 4) Hold the mold in the jello for just 10 seconds, no longer! 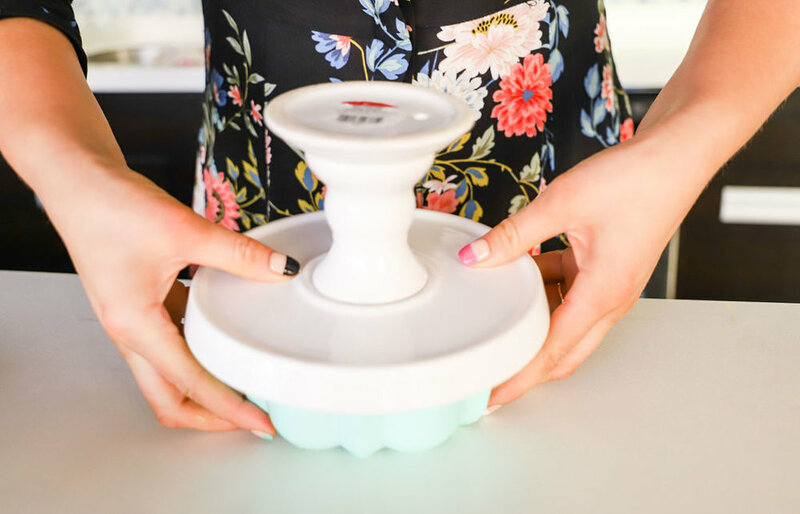 5) Put the plate on top of the jello mold (where you want it to be placed) and flip them over together. 6) Pray the jello pops out. 7) If the Jello does NOT pop out, dip it in the hot water for another 10 seconds and repeat. Another trick I have is to use a knife to gently release the edges of the jello from the mold before you try to release it, but this isn’t my favorite option because it can damage the edges. Garnish your beautiful creation with whipped cream and berries and prepare to make your friends and family SO HAPPY. P.S. This serves a lot. Like 10 people maybe? I mean, how much jello can one person eat?